34 items found for "Show all items"
What is going on in your country? With the countdown already started for the 2018 edition of the European Day of Languages, over 300 events are currently in the online calendar of activities. There is no shortage of creative ideas for celebrating the Day - with seminars on multilingualism, polyglot gatherings, language cafés, a European week of Languages, neighbouring languages festivals, a journey through and languages and cultures and, of course, speak dating – to make some new friends! Geographically there are events spread all over the 4 corners of Europe as well as beyond in India and Canada. If you have not already done so, you are very welcome to promote any events and activities you are involved with in the online calendar. We hope that you can help us to break last year’s record of 1,290 events (see below for some examples)! Have you ever wondered how multilingual your classroom/organisation actually is? There are often many more languages represented in a school classroom, an office or an association than you expect. For the 2018 European Day of Languages we are looking for schools, offices, associations and in fact any organisations or individuals, who would like to showcase their languages (spoken and/or written) by any creative means they wish. Through this initiative we would like to highlight multilingual Europe in practice. By 10 October 2018 we hope to identify Europe’s most multilingual and intercultural classrooms and workplaces! All details on how to participate in the initiative are available on the dedicated web page https://edl.ecml.at/edlinitiative. EDL t-shirt design contest: the winning t-shirt design for the 2018 European Day of Languages (by Emily Van Cantfort from Belgium) can be ordered from spreadshirts.com. We are organising the contest again for a new design for the 2019 edition of the Day. The most innovative European Day of Languages’ event: the ‘most innovative EDL event’ competition had winners in 15 countries in 2017. We are running this feature again in 2018 from 20 September – 20 October with a ‘modest’ prize for the event receiving the most votes in each participating country (where there are more than 10 events registered in the EDL calendar). The website has been given a ‘make-over’ for this year with a new easy to use mobile friendly structure. It is now available in 37 languages with the Welsh language version (to be added shortly) as the newest addition. The ‘facts and fun’ section of the website, in particular, has been restructured and further developed. Linked to this year’s European Year of Cultural Heritage a ‘place names’ section showcases cities, towns and villages and how they came to receive their names. As with all our resources, we also welcome your contributions! There are lots more downloadable resources available, with posters, postcards, banners, graphic images and logos for social media and printing as well as flyers in 25 languages. Even if you haven’t managed to receive promotional items, we hope that these will help to ‘spice up’ your events. Find out how your country is signed in International Sign Language, which is the 2nd second largest French-speaking city in the world (it is not in France)?, what is the longest word and place name?, which famous actress is fluent in 5 languages?, what is special about the phrase ‘never odd or even’?, and of course much more. This year the European Centre for Modern Languages of the Council of Europe is again involved in organising a language festival on 27 September from 09:00-18.00. The Graz Museum and its surrounding area will be transformed for the day into a language hub. All age groups are invited to the festival which offers a wide range of activities highlighting the linguistic and cultural diversity of the city of Graz. The event features a lively mix of language workshops, games, quizzes and international theatre, music and dance. We hope to attract over 2000 participants. The European Commission’s translation field offices are involved in the organisation of over 70 events taking place in cities around Europe – you can find details of all these events in the online calendar. Interested in multilingual classrooms and projects? Get inspired by language diversity! In the webinar on the European Commission’s school education gateway Sarah Breslin, Executive Director of the European Centre for Modern Languages of the Council of Europe, will present language learning and the benefits of language diversity in education. Gro Caspersen will present language learning in practice through the "Wise Words" project, which has received the European Language Label, meaning it has contributed substantially to the promotion of innovative language teaching and learning, throughout all Europe. Learn more and pre-register via this link. 11 events taking place in celebration of the Day! 6. Englisches Mitmachkino zum berühmten Film "The sound of music"
A webinar will be held on 12 October to launch the project’s Pedagogical framework for the integration of ICT and introduce and the accompanying training modules. Thirty-nine professionals from 30 ECML member states, Belgium, Canada and the United Kingdom discussed principles and approaches which contribute to inspiring language learning and teaching in the early years and how these can be applied to the individual context of the different ECML member states. Under the guidance of the ECML project team – Flore Schank (Luxembourg), Déirdre Kirwan (Ireland), Dana Musilova (Czech Republic), Ingeborg Birnie (United Kingdom), and Jakob Patekar (Croatia), participants worked towards a shared understanding of the concept of plurilingualism and what this means for the teaching and learning of language(s) in the early years. The project is designed to help professionals harness opportunities inherent in linguistically diverse classrooms and use them for the benefit of all pupils. Results of scientific research relevant to the context of this project. "Action Research Communities for language teachers (ARC)"
The goal of this ECML project is to contribute towards quality enhancement in the language classroom through the application of action research approaches. This is achieved by tapping into existing networks with a view to creating new learning communities, which can be replicated across ECML member states. To this end, action research tools have been designed to support teachers who want to carry out projects and to encourage dialogue between practitioners in schools and universities. The ARC team held a workshop in Reykjavík for Upper Secondary teachers of Danish, English, French, German, Norwegian and Icelandic as an L2. The participants worked on planning teaching units focusing on intercultural learning. They also planned a mini-action research project corresponding to the first stage of the "ARC spiral". The final preparations are being made for the ProSign/efsli conference. The event will focus on the implementation of the Common European Framework of Reference for Languages, the European Language Portfolio, the teachers' competency profile, didactics and assessment. The target groups are researchers specialising in L2 teaching, learning and assessment, practitioners and decision makers. setting parameters for the final workshop in October 2018, that will allow participants to review and discuss the project’s products in relation to work-related language development for migrants and ethnic minorities in their own various countries. Marita Härmälä (Finnish Education Evaluation Centre) and Eli MOE (University of Bergen) reported on the ongoing ECML project centered on the language of schooling. It builds on the results of the ECML Language Descriptors (2012-2015) project where subject specific CEFR descriptors were developed for young L2 learners in history and mathematics. 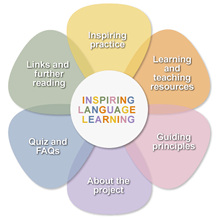 The aim of the current project is to develop samples of teaching materials including both content and language goals. For the first time, an international training and workshop for German specialists on the "Electronic European Language Portfolio – Supporting local networks in using an electronic European Language Portfolio" was held in Photon College in Gyumri, with the support of the ECML. The European Language Portfolio is known to the Armenian teachers and learners, but the e-Portfolio was a new concept. It is needed to promote better assessment of the learners’ linguistic skills and competences. The ECML moderators - Bärbel Kühn (coordinator), University of Bremen and Technical University of Darmstadt, Germany / Michael Langner, University of Fribourg, Switzerland - provided the trainees with a new methodology, equipped them with new skills and competences to help them to meet the requirements of contemporary language education. The Armenian education institutions are in their initial stages of implementating CLIL in the content of study programmes. The workshop participants acquired valuable knowledge and skills which they may further use in their teaching practice, and will act as multipliers by introducing the main ideas of CLIL at their respective education institutions. CLIL education will enable teachers to identify the appropriate content to be taught, to view the content from different cultural perspectives, deploy strategies to support language learning in content classes, to scaffold language learning during content classes by learning specialized vocabulary, etc. Language for Work: A quick guide – How to help adult migrants develop work-related language skills - Now also available in French, Italian and Spanish! For the many migrants who arrive with limited language skills and no recognised qualifications, support to develop work-related language skills is vital. This resource offers guidance on how to provide that support. The quick guide is now available in 10 languages: Bulgarian, Croatian, Dutch, English, French (latest version), German, Irish, Italian, Spanish and Swedish. Authors: Alexander Braddell, Mathilde Grünhage-Monetti, Christophe Portefin and Kerstin Sjösvärd. To highlight the wealth of French-speaking research in sciences, the Délégation générale à la langue française et aux langues de France has developed a new programme with Huma-Num (a very large-scale research infrastructure). It is now possible to access all articles and journals in French on the ISIDORE documentary platform. Any Francophone wishing to access content in French in the humanities and social sciences can have a synaptic view in their field of study and research. The Barometer, edited by Alain Calvet and Louis-Jean Calvet, with the support of the Délégation générale à la langue française et aux langues de France, proposes a ranking of the 634 most widely spoken languages in the world through 12 intrinsic and contextual criteria (status, number of speakers, number of Wikipedia pages, number of publications translated from and into each language, university teaching, literary prizes, Internet penetration, etc.). The Breton language: what culture? M Dag Fjæstad, Norwegian National Centre for Multicultural Education (NAFO), Oslo Metropolitan University, and Ms Solena Diana Pradayrol, Norwegian National Centre for English and other Foreign Languages (Fremmedspråksenteret), Halden, Norway, as National Contact Points. Ms Ana Langović Milićević, State Secretary in charge of Development and International Cooperation, Ministry of Education, Science and Technological development, Serbia, as the Governing Board member. The ECML would like to express its deepest gratitude to Mr Ulrik Franik (Germany), Ms Renate Evjenth (Norway) and Ms Gordana Predic (Serbia) for their valuable support and involvement during the last years. The primary purpose of this survey is to map the language requirements and knowledge of society requirements for migrants in Council of Europe member states prior to entry, for residence and for citizenship with the aim of identifying trends in policies for the linguistic integration of migrants. Particular attention is dedicated to vulnerable groups, such as illiterate/low-literate migrants, women, unaccompanied minors, asylum seekers and refugees. A subsequent report will be drafted; one of the aims will be to stimulate critical reflection as response to the Committee of Ministers Action Plan on Migrant and Refugee Children in Europe. The latest newsletter of the Council of Europe’s Education Department Newsletter is dedicated to the “European Qualifications Passport for Refugees”. This initiative aims to help refugees to be admitted to further studies or enter the job market in the host country by promoting a methodology to assess refugees’ qualifications even in absence of full documentation. Higher Education for Diversity, Social Inclusion and Community. A Democratic Imperative, edited by Sjur Bergan and Ira Harkavy, explores the democratic mission of higher education at a time when our societies are facing increasing difficulties in reconciling acceptance of diversity and social inclusion with the need for community. On 18 and 19 June 2018, the Council of Europe organised this high-level conference under the Croatian Chairmanship of the Committee of Ministers of the Council of Europe. The conclusions of the conference should feed into a reflection process by the Committee of Ministers of the Council of Europe on how the respective monitoring mechanisms of the two conventions can be reinforced to effectively respond to the above-mentioned challenges. Giving regional and minority languages a say! We do it freely and for everyone to hear. Keeping quiet belongs to the past. It’s time to speak up! Let's go get our language! This new online course is open to learners with an interest on the concept of human rights education as part of the Global Education context, willing to focus in its practice while exploring its dilemmas and challenges. Open to anyone, wherever you are in the world, you can take part in this course from the comfort of your own home. At the end of this four-week course learners will be able to: understand the relation between global education and human rights education; comprehend human rights education in their local level and its interconnections with the global context; comprehend the dilemmas and challenges in human rights education; practice human rights education through the organisation of activities. Submit your application until 24 September 2018: register directly at the social learning platform of The Network University. Final selection of participants: 26 September 2018. LangOER - "Enhance teaching and learning of less used languages through OER/OEP"
The LangOER project was a 3-year running Life Long Learning project, coordinated by Mercator European Research Centre on Multilingualism and Language Learning (Fryske Akademy). LangOER aims to contribute to the promotion of learning and teaching of less used European languages by linking them to the global challenges of Open Education. An overview of the workpackages and materials can be found here.